The Loxone intercom expands your smartphone and tablet to function as a video intercom in your home. Always see who's at your door! Not all materials are suitable for outdoor use. The Loxone Intercom however, relies on real, solid glass and is entirely prepared for all weather, offering long-term durability. To prepare for all weather conditions, we’ve also taken special care with the housing. It has a robust 7.5mm (.30″) thick aluminum with anodized surface that’s ready to fight against all weather! The Loxone intercom can easily be integrated into your Smart Home. We’ve coordinated the software and hardware to a tee! 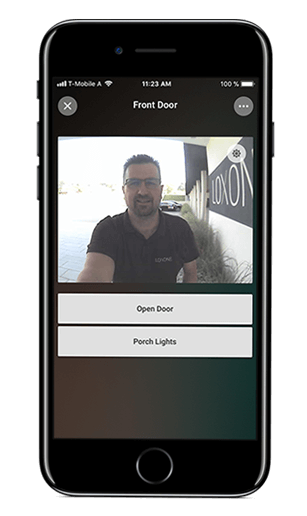 Whether you’re at home or on the road – on the Loxone web interface, or using the free Loxone app for tablet or smartphone, you can see who’s at your door! Whether it’s a friend, family member or delivery worker, you can open the door remotely, ignore them or speak to them! You can see the pop up when the app is open, and for instant notification when your phone is locked and in your pocket you can use our Caller Service. 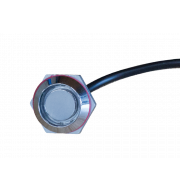 Check out the high quality of the picture and sound of the intercom Loxone in this video. With our smartphone and tablet-compatible video intercom, you not only have clear live images of your visitor, you can easily speak to them from wherever you are with excellent sound quality. Use the surface mount box to attach the Loxone intercom on the wall. 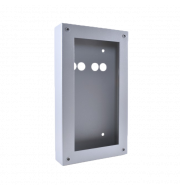 Use the flush-mounted box for installing the Loxone intercom directly into the wall.